Anyways, I think this sign below is probably the funniest one of all time. I do apologise if it offends anyone. But I can only imagine it will make 99% of us laugh. Not just chuckle, but laugh out loud. 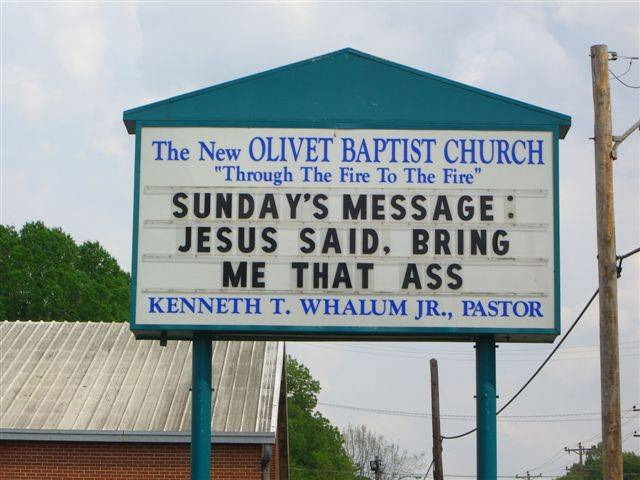 Just as a primer, this was the actual sign of a church in Memphis, my hometown in the US. It was put up one year in preparation for Palm Sunday. Hopefully that explains the sign a little more. For those that are too offended by it, the one below is a little cleaner. This entry was tagged church signs, humour. Bookmark the permalink. I’ve got one I like even better – posted on a Muslim blog, no less! 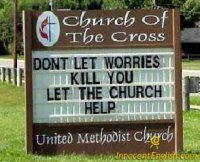 Online you can actually find a “funny church sign maker,” where you can make your own. Not nearly as fun as the real thing, but I think some of the photos out there are actually made with it, hehe.